No one likes waiting to be seen at the doctor's office. Although I recently visited a physician whose waiting room offered more than stale magazines. 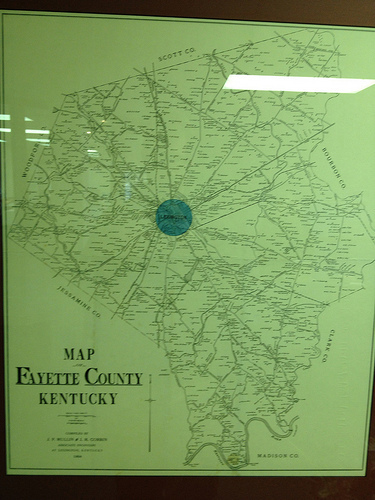 As art on the walls, the physician's practice groups used historic maps of Kentucky, of Fayette County, and of Madison County. 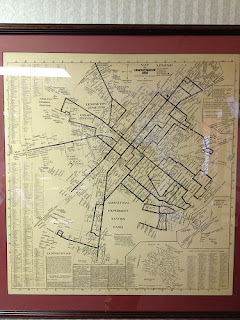 Fortunately, with few other patients waiting I was able to stand, examine, and photograph the historical maps of Lexington dating from 1904, 1930 and 1946/47. 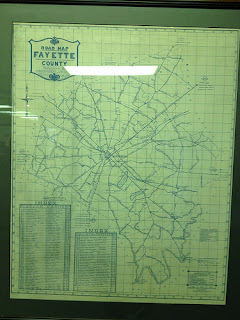 The 1904 map of Fayette County was compiled by associate engineers J.P. Mullin and J.M. Corbin. The map noted the locations of schools, streams, and most notably structures in the rural parts of the county. Small black squares accompanied by names of landowners revealed who lived in and around Fayette County's lost communities. 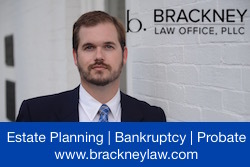 These communities, like Athens and South Elkhorn, are represented in larger typeface on the map. A high-resolution copy of the map, though in poor condition, is also available online through the Kentucky Historical Society. 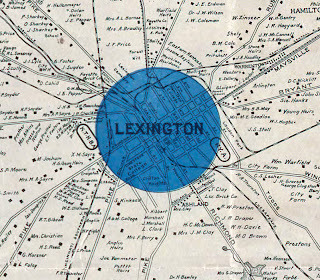 Below I have zoomed in, using the KHS map, on the city of Lexington. You can clearly see both the Kentucky Association racetrack on the city's east side as well as the KTHBA (the Red Mile). 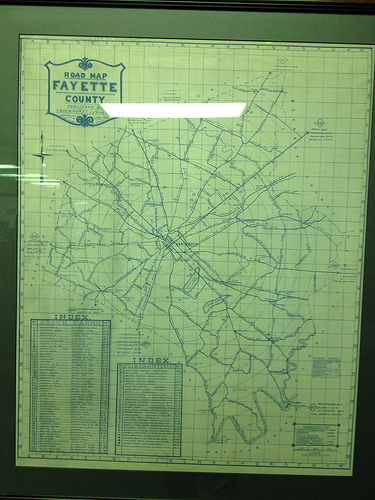 The 1930 Road Map of Fayette County was published by T.B. DeWhurst of Lexington as a road map showing the major arteries and connectors comprising Fayette County's roads. Two tables noted the locations of "Stock Farms" and "Points of Interest." Most of the "points of interest" were churches, but several non-ecclesiastical sites were noteworthy. Related to Henry Clay, both Ashland and the Clay Monument at the Lexington Cemetery were considered of interest. 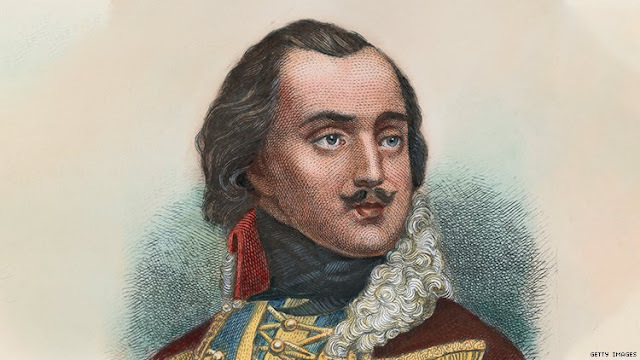 Two country clubs made the list as did the Iroquois Hunt Club. Two springs, the municipal water works, and Joyland Park also made the cut. Of particular note, however, were the two airports listed. 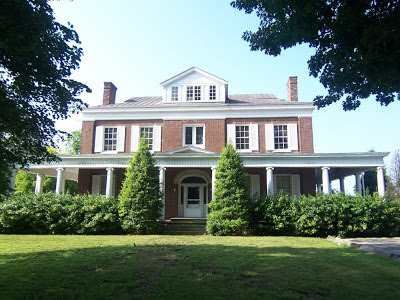 Lexington's first airfield, "Municipal Airfield, Leestown Pike" existed on a "level pasture surrounded by trees and telephone wires." The private field was located where the Meadowthorpe neighborhood is now located. 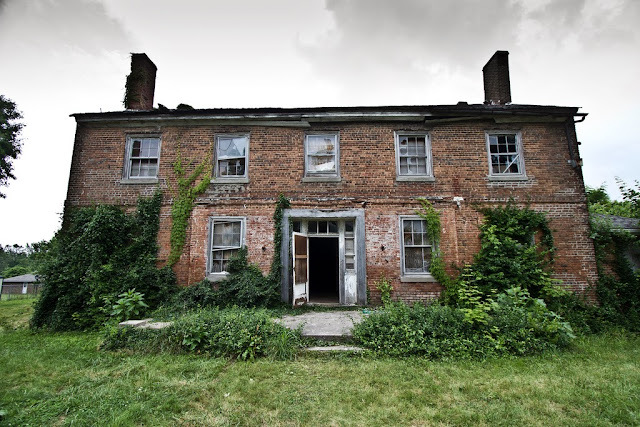 The first municipal airport in Kentucky, also mentioned as "New Municipal Airpot, Newtown Pike" was also noted; it sat on ground now occupied by Fasig-Tipton and opened in 1930. 1946/47 Map of Lexington, Ky. 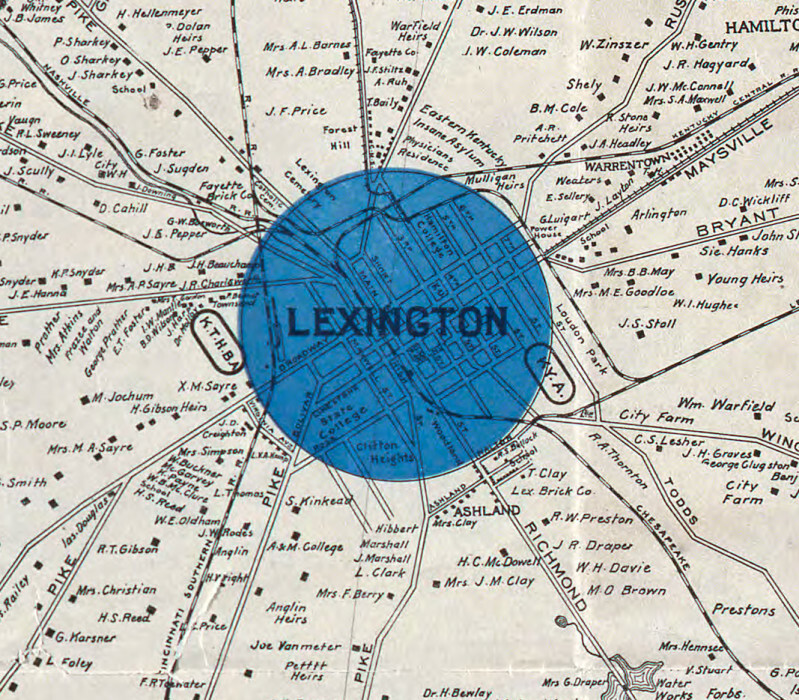 The 1946/47 map contained a great amount of detail as to the roads in central Lexington. Like the 1930 map, a list of "Noted Fayette County Farms" was included. So too was a small map of the "Highways out of Lexington, Ky."
The map, compiled and drawn by Thomas Monson, was the only in the physician's collection which extended to the city limits of the day. A drive out Richmond Road would reach the country after Chinoe. Near campus neighborhoods, like Clifton Heights, remained. And the "Government Houseing Project" known as Bluegrass-Aspendale stood on the old land once occupied by the old Kentucky Association racetrack. 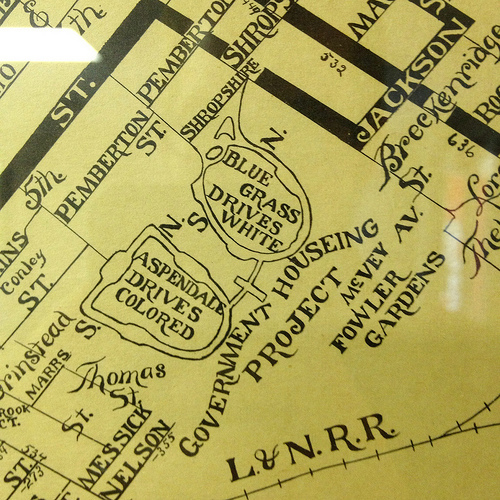 As you can see, the housing project was segregated: Bluegrass Drives for whites and Aspendale Drives for coloreds. 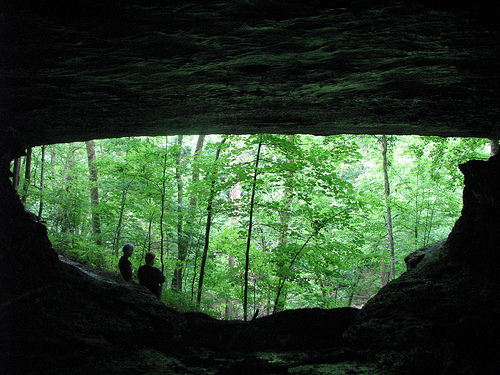 Have you found history in an unusual place? Share in the comments! More photos of Fayette County maps are on flickr.